ATHENS, GA- Several Athens and UGA Organizations are trying to raise awareness of AIDS today for World AIDS Day. 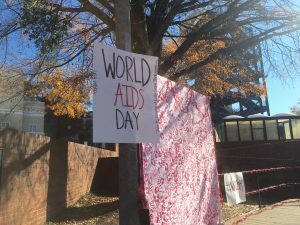 Georgia has the second highest number of people affected by HIV/ AIDS in the nation. AIDS Athens is having free HIV screenings all week at different locations throughout Athens. Locations can be found on their Facebook page. UGA HEROS will be at Tate Student Center from 9-4 to raise awareness on campus.